Sagar is exhilarated, as he meets Prakriti, his childhood love, who had mysteriously disappeared from his life twelve years back. Soon, this friendship of yesteryears rekindles. Blown by her simplicity and undiminished zest for life, he wishes to settle down with her. But destiny plays the roulette, when Sagar stumbles upon Prakriti’s dark past. Dejected, he leaves the town in search of solace. But time fails to heal his wounds, for he misses her, and inner peace continues to elude him. Consumed by anger over his own miserable failures, he returns to her to resolve his past once and for all. At dawn, he takes her blindfolded to a mountain cliff. 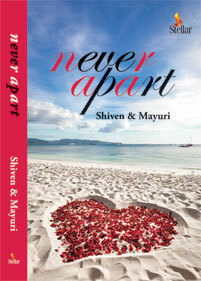 Based in Bangalore, Shiven is an engineering graduate from National Institute of Technology (NIT), Rourkela. As editor-in-chief of the college magazine, The Renaissance, for three consecutive years, he penned numerous articles, and published interviews of eminent professionals visiting the faculty. He also wrote and published two anthologies of poems, The Reminiscences and The Tribute. 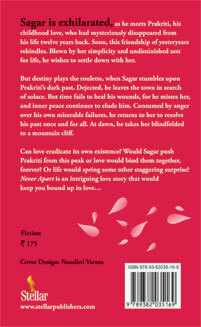 A particular poem, Never Away, Never Apart, which features in this novel, was adjudged the best in an NIT poetry competition. Stepping into the corporate world, he worked at Accenture and Sapient, and subsequently coveted a scholarship at Texas A&M University, to accomplish his Masters in Information Systems. However, he returned to India even though his destination was still hazy. But he had resolved to pursue his own path, refusing to be a specimen copy. He wandered in Dharamsala, learnt meditation, imbibing the finer nuances of Buddhism, and lived a simple life that lent him the much needed direction. Soon, he moved back to the corporate world, but this time, the die was cast. He had to follow his heart, and be a writer. He also runs an educational forum, sQuiz my Brain, which conducts quiz programmes both online and in schools. Apart from Never Apart, where he shares credit with his inspirational muse and wife Mayuri, he’s currently working on a historical, romantic novel with an American writer of Indian origin.